What are SB you ask? SB are points you earn on Swagbucks, a website where you can get gift cards for the things you do online - recently I've gotten an essential oil diffuser, Muddy Paws rug for my dogs, and a new welcome mat thanks to Swagbucks! The celebration begins on Monday, February 27th at 12am PT and goes all day long! All you have to do is look out for the Swag Code notifications, enter the code, and you earn SB (which can be redeemed for gift cards)! 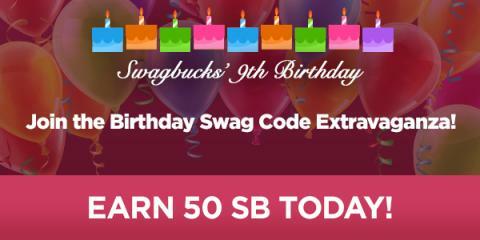 There will be 9 Swag Codes throughout the day worth a total of 50 SB!